In addition to everything that defines a brush and how it functions and paints there are a handful of options that determine how it appears and is interacts when saved and selected. Right click on a brush you want to edit brush options for. Select Edit Brush Options from the popup menu. NOTE: Because the Brush Options dialog was launched from a brush in the Brush Shortcuts the brush in the Brush Shortcuts is being modified not the brush that it was copied from in the ArtSet. 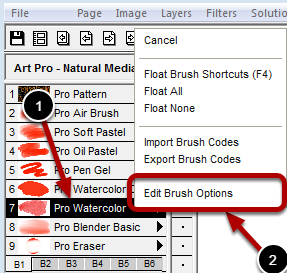 To edit the brush options for a Brush in an ArtSet you must use the Edit ArtSet dialog. This is the current brush name. Enter new text here to change the brush name as it appears in the Brush Shortcuts panel. If the Save Color Information option is checked the current color will be saved with the brush each time the brush is saved back to the shortcuts. 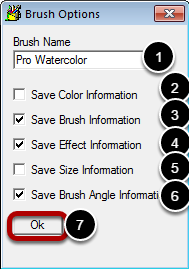 If the Save Brush information option is checked the core brush information will be saved with the brush. If this option is not checked the brush actually becomes a brush modifier and when selected will only update the current brush rather than become the current brush. If the Save Effect Information option is checked the brush effect information will be saved with the brush. Generally if Save Brush Information is checked this option would be checked. If the Save Size Information option is checked the current size will be saved with the brush each time the brush is saved back to the shortcuts. If the Save Brush Angle Information option is checked the current brush rotation will be saved with the brush each time the brush is saved back to the shortcuts. Click the OK button when done.